Buffeted by one jaw-dropping obstacle after another, Orenstein seeks answers both medical and spiritual, all the while trying to save a marriage threatened by cycles, appointments, procedures, and disappointments. Her journey takes her around America and as far as East Asia - on the way she visits an ex-boyfriend who now has fifteen children; encounters 'parasite singles' in Tokyo, women who are rejecting marriage and motherhood in favour of shopping sprees and foreign travel; and shares stories with survivors of the atomic bomb in Hiroshima. The world's professional women are only now beginning to become aware of the risks and realities of 'having it all', and Orenstein's saga unfolds as infertility is developing into a boom industry, with over a million women a year seeking treatment. Waiting for Daisy is a profoundly honest, wryly funny report from the front, a story about doing all the things you swore you'd never do to get something you hadn't even been sure you wanted; it's about being a woman, about trying to become a mother, and above all, about the ambivalence, obsession and sacrifice that characterises the struggles of so many modern couples. First, I liked this book because it was entertaining. And a fast read. Orenstein is funny. She's extremely candid about her fertility treatments, both conventional and alternative. One of the things I liked MOST in the book is that she seeks out alternative medicine...and it FAILS. I get so tired of these inspirational, "I became a vegan and took acupuncture and all of a sudden...I was pregnant. Yippee!" In fact, Orenstein's acupuncturist basically dumps her when she can't get pregnant after a long time! LOL! She also even goes so far as to get donor eggs from a young woman whom she had befriended, who was an admirer of her earlier books. She feels guilty about asking this young woman to do it....but the guilt doesn't stop her. And the IVF with the 21 year old donor's eggs fails, too. She does conventional IVF, too, which ultimately fails..and writes about how shoddily her case was handled at IVF clinics, where the doctors seem more concerned with a fast profit than with long term success for their patients. Oh, and she had cancer, too, right before her infertility started. Frankly, I am surprised anyone encouraged her to go on all these fertility drugs and to get pregnant in light of that risk factor. But she goes for it anyway. So, Orenstein pretty much experiences it all...and watches everything.. . FAIL. She is also very frank about her fights with her husband, which seem serious. 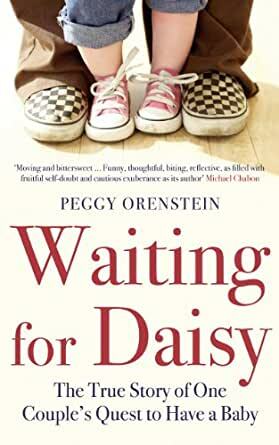 I am so grateful to Peggy Orenstein for writing this book. It's the first memoir about infertility I've read that truly captured my experience. Orenstein's humor and unsparing honesty made me feel like someone out there got me--and got how utterly crazy infertility can make an otherwise intelligent and competent woman. The obsessiveness, the hopelessness, the damage to one's marriage and self-esteem, the constant "what if's," the conviction that we've done everything wrong--she gets it. What's more, she can chronicle it in such a way that you're laughing out loud. I've read this book twice now, and each time it brings comfort and makes me smile. I'm sure I'll read it again before my infertility journey is over. A great book. 5.0 out of 5 starsI really loved this book! As one of the lucky, married at 35, who still managed 5 healthy, biological kids without IVF (3 after 35, and 1 at 43, 1 at 45) the author was very relatable and brutally funny. Oh, and I cried. Well written memoir. It has to be honest because the author does not portray herself in a very flattering manner. She comes across as obnoxious toward her husband. Most of the book centers on her struggles with in vitro, but then when she is finally successful there is almost nothing about THAT experience. After all of the darkness of the rest of the book, it would have been wonderful to share what must have been her joy. Great read for those going through infertility treatments. Not a medical advise, or treatment book. This is a book you can read, and relate to. Often times cheering for the main character, and sometimes wanting to beat her on the head for making the choices that she makes. If you have gone through any infertility treatments, or are about to, it is a book that you can relate to, or will relate to.